The Village in the Trees was the result of a short three day workshop held in Aviemore, Scotland, by Highland Birchwoods and funded by the European Union. The aim of the workshop was to find new and exciting fields where the Scots Pine could be used. 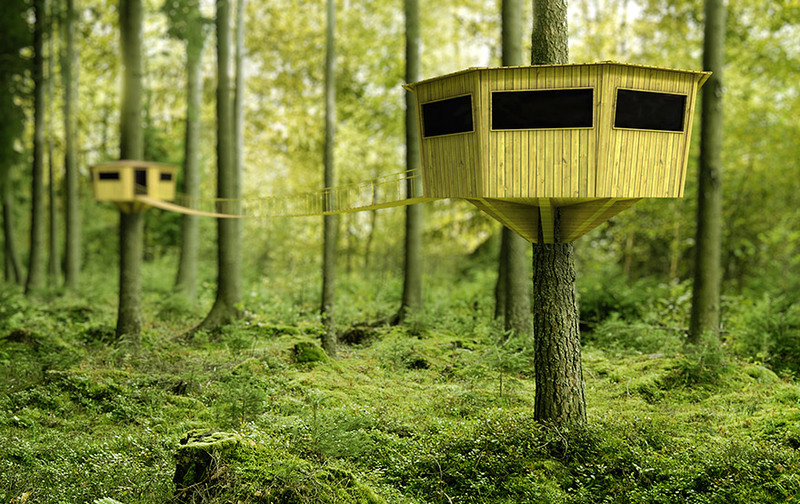 After one brief, passing mentioning of Ewoks the idea generation rooted and the creation of elevated tree houses started. Tree-top houses are certainly nothing new, some cultures have revolved around them, they’ve been put together by children (and their parents) for some time. The aforementioned Ewoks of Star Wars had their own take on them and they have even been made into exclusive, high priced, hotels in the north of Sweden. Many places in the Scottish and Scandinavian wilderness are only accessible by hiking quite some distance, too far to make it back to your point of origin in one day alone. When you pass the threshold of needing to bring shelter with you you also pass a point of easiness both in terms of planning and in terms of carrying weight. What if you could have premade shelters set up at strategic hiking spots for hikers to use as overnight accommodation to either continue their hike or to return the next day? Mountain huts for climbers and mountaineers already exist but the hiking segment is largely forgotten. The huts are stripped down to the bare necessities with only a bed, a table, a chair and a first aid box inside of the hut to underline the closeness to the surrounding nature. The big windows lets in light and maximizes the panoramic view for the visitor.